Houston is an amazing place to live and work, but one of the things that most irritates those who call this city home is the sometimes insufferable traffic. According to a recent study by INRIX, Houston ranks the second worst city in Texas for traffic and gridlock, 11th in the United States, and 28th among cities around the world. At least we can take a little solace in the fact that things aren’t as bad in Houston as they are in Dallas, but while that might make you feel a little better about the local traffic situation, it probably isn’t going to keep us from complaining about the traffic. One aspect that goes hand in hand with more cars on the road is an increase in the number of accidents, which also worsens grid lock. It’s a common sight for most of us on our evening commutes to see a fender bender or more serious accident on the side of the road. While we tend to assume that these accidents are random, one-off occurrences that could happen anywhere, when you look at the data and statistics over time, a different picture begins to emerge. The Texas Department of Transportation (TxDOT) studied the crash data over a period of four years across the entire state and found that many crashes could be attributed to single intersections or interchanges, marking them as particularly dangerous for commuters. While Dallas may have worse traffic and gridlock, the TxDOT data show that Houston is far and away the most accident-prone city in the state. 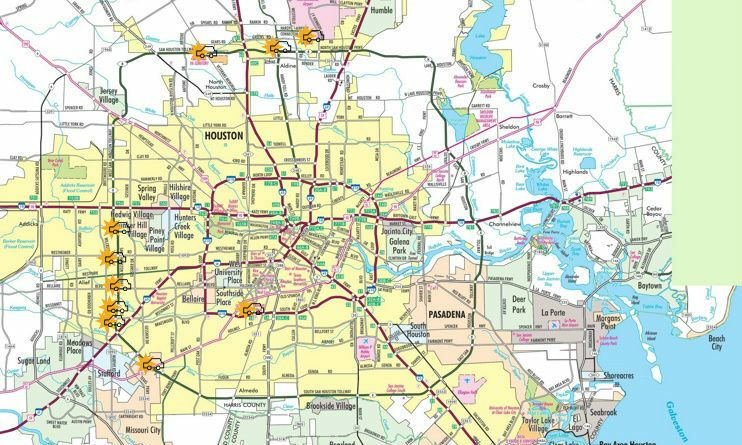 It would appear that Houston is in the midst of a traffic crisis, since the city dominated the ranking in terms of the sheer number of dangerous intersections, as well as featuring the #1 most dangerous intersection in the state. The following are the 10 worst intersections in Houston, and where you should be sure to be extra attentive. 10. Bellaire Blvd. & San Houston Pkwy with 155 crashes. 9. IH 45 & Sam Houston Pkwy with 156 crashes. 8. Main St. & Sam Houston Pkwy with 166 crashes. 7. Sam Houston Pkwy & Veterans Memorial Dr. with 174 crashes. 6. Greens Rd. & IH 45 with 189 crashes. 5. Beechnut & Sam Houston Pkwy with 189 crashes. 4. Main St. and South Loop with 206 crashes. 3. Sam Houston Pkwy & Westheimer with 233 crashes. 2. Hardy Rd. & Sam Houston Pkwy with 280 crashes. 1. Bissonnet St. & Sam Houston Pkwy with 335 crashes. As you can see, the Sam Houston Parkway is the scene of many of these accidents, so it is important to practice defensive driving and maintain high alertness of other drivers when you are in the area. The intersection with Bissonnet Street in the southwest corner of the city is the most dangerous not only in Houston by across the entire state, so be extra careful when passing through. These intersections can be dangerous for many different reasons, but the number one cause is typically impatient and imprudent drivers who are in a hurry to get home. Simply knowing where these dangerous intersections are can help you avoid trouble when driving past these known problem areas, but even the most cautious driver may one day find themselves involved in a car accident in Houston due to the negligent actions of another driver. If you’ve been involved in a car wreck, then you need the help of an experienced Houston car accident attorney who understands Texas traffic laws and how to determine and prove who was at fault. Having great legal representation is one of the best steps you can take following an accident in order to ensure you aren’t held liable for something that wasn’t your fault, and that you are able to receive the compensation you need and deserve after a wreck. For your free, no obligation legal consultation, please call the auto accident lawyers of Fears Nachawati at (866) 705-7584 to schedule your visit to our Houston office on Kirby Drive.